French traditionalist and academic painter William Adolphe Bouguereau was a Realist painter. Most of his works dealt with mythological themes, using classical subjects and turning them into modern interpretations. He has an exemplary ability to draw the female human body, be it young children, teenagers and adults. The sheer beauty of his paintings captured the minutest details like a camera in sharp focus. Bouguereau was born in 1825. During the height of his career he achieved much success and recognition in his native country as well as in the United States. He received many top prizes and official honors. He was the perfect example of a salon painter during his time, but was railed by the Impressionists. He was a great figure painter, which was showcased in his large body of work. Partly due to changing tastes, Bouguereau’s art and his status as a painter fell out of favor by the early part of the 20th century. 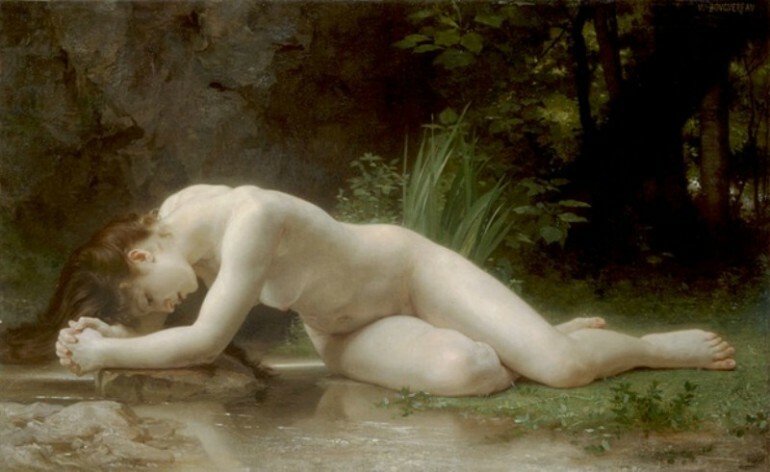 However, the revival of interest in figure painting around the 1980s paved the way for people and artists to rediscover Bouguereau and his fantastic works. Throughout his artistic career, Bouguereau was able to create 822 finished paintings (those that are known). However, there is still the question of where most of his paintings are. William-Adolphe Bouguereau was born on November 30, 1825 in La Rochelle, France. His family were olive oil and wine merchants and without the intervention of his uncle who was a Roman Catholic priest, he would have joined the family business. His uncle taught him Biblical and classical subjects and sent him to high school. That early he was already showing his artistic talents. A client convinced his father to have him study at the École des Beaux-Arts in Bordeaux. In school he painted a Saint Roch depiction, which won him the top prize in figure painting. He supplemented his allowance by designing preserve and jam labels so he could stay in school. It was still his uncle who was instrumental in Bouguereau getting commission to paint portraits of parishioners to earn money for school. His kind aunt later matched the money he earned from the commission which allowed him to enter the École des Beaux-Arts. He was so dedicated to his art that he even studied archeology and historical costumes and had lessons in anatomical dissections to supplement his formal training in drawing. Soon he was admitted to François-Edouard Picot’s studio and learned the academic style of painting. The academic style of painting placed the highest value on mythological and historical subjects in which Bouguereau was highly skilled. He easily won the Prix de Rome in 1850 when he was 26 years old. His submission was entitled “Zenobia Found by Shepherds on the Banks of the Araxes.” His prize was to spend more than a year at Villa Medici in Rome where he was able to study the antiquities from the Romans, Etruscans and Greeks, and study the masterpieces and other works of the Renaissance artists aside from formal lessons. He also had lessons in classical literature, further enhancing his understanding and love for classical art. Throughout his working life Bouguereau participated in the annual exhibitions of the Paris Salon, his traditional academic style very much appreciated by the Salon judges. A reviewer said that he had knowledge and a natural instinct for contour and that he attempted to follow in the footsteps of the artists and ancients such as Raphael, who, incidentally was one of Bouguereau’s favorite. He even satisfied the requirements of the Prix de Rome with his copy of “The Triumph of Galatea” that was a creation of Raphael. In the majority of Bouguereau’s works the classical approach to subject matter, form and composition were evident. He also became known for his very graceful portraits, because people see that he could make the model/sitter beautiful while maintaining their likeness. He was able to establish strong connections with art dealers, especially Paul Durand-Ruel who had convinced several clients to patronize the artists that exhibited in the Paris Salon. Through Durand-Ruel Bouguereau met Hugues Merle, another French Realist painter whose later works were compared to Bouguereau. The fame of William-Adolphe Bouguereau extended beyond France and his substantial income allowed him to buy a big house and studio in Montparnasse for his wife and five children. Due to his classical art training, his works were very much admired and appealed to very wealthy patrons of the art. He concentrated on the beauty of the human form in a naked female, which brought to life madonnas, shepherdesses, bathers, nymphs and goddesses. He prepared for his paintings by doing several oil sketches and pencil studies in great detail, resulting in very accurate rendering of the human body. Bouguereau was particularly notable for his painting of hands, feet and skin. In 1875, he stared teaching drawing at the co-ed art school Académie Julian and later used his influence for art schools to be open to women. Many of his works remain in private collections and gallery curators became curious about his work. In 1974 the New York Cultural Center showed some of his works. The Borghi Gallery featured 23 of his oil paintings in 1984 and there was also a major touring exhibition of his works organized by the Montreal Museum of Fine Arts that same year. It opened at Paris’ Musée du Petit-Palais and went on to The Wadsworth Atheneum in Hartford, Connecticut before concluding the exhibition in Montreal. American art collector Fred Ross, who also owns several Bouguereau paintings, promotes the artist at his Art Renewal Center website.